Could collaboration boost MTN Qhubeka’s chances of riding its first Grand Tour next year? In what the MTN Qhubeka team’s fans will hope is a sign of a growing relationship between it and RCS Sport, the organisers of the Giro d’Italia and the team’s secondary sponsor have combined to hand over a large number of bicycles to schoolchildren in South Africa. A total of 120 Qhubeka Buffalo bikes were given to children at the Orange Farm in Johannesburg today. Distributed as part of the Qhubeka Bicycle Education Empowerment Programme (BEEP) scheme, 58 of those machines were paid for by RCS Sport. The money needed was raised at its gala dinner held before the Milan-Sanremo Classic in March, and it was decided that Qhubeka should be the charity that the organisation would make the donation to. The RCS Sport Cycling marketing manager Marco Gobbi said that the organisation was ‘honoured’ to have the opportunity to help and to be part of what he called an extraordinary initiative. “I think this is linked to the magic of sport. Cycling is born in our streets – from kids who ride for fun or cycle for need, [so] it’s fantastic to be able to tangibly contribute to help those kids in South Africa. Donating a bicycle to a child in this country may mean granting him or her a chance to reach school and to help the family by completing travel distances otherwise impossible to cover. He pointed out that in Italy another scheme involving bikes, namely the Biciscuolo project, promotes the use of cycling. It means that RCS Sport has an awareness of initiatives involving the machines. MTN Qhubeka went on to win Milan Sanremo, with Gerald Ciolek showing a brilliant finish to beat Peter Sagan (Cannondale) and Fabian Cancellara (RadioShack Leopard). It is the biggest result to date for the team, and marked the moment when the Pro Continental squad proved it was capable of taking on and beating the world’s best in the top events. Gobbi drew parallels between the joy of those receiving the new bikes and the team’s winning emotions earlier this year. “The smile of these kids, together with Ciolek celebrating on the finish line of the most epic Milan-Sanremo in recent history will remain as one the highest and most emotional moments of our past season, testifying how cycling can still create stories which look like modern fairy tales,” he stated. Qhubeka is an African charity which seeks to improve the lives of people there through distributing bicycles to them. South Africa has a total of sixteen million school-going children. Three quarters of these walk to school and, of that twelve million, half a million have to walk more than two hours each way. This impacts on their exam results, with just four out of ten students achieving a qualification higher than grade nine. According to BEEP, those who receive Qhubeka bikes see a reduction in commuting time of 75% and, with the jump in attendance, their marks increase by an average of 23%. The benefits are clear and will have a major effect on the country in the long term. In addition to that, it also has the side benefit of increasing the pool of young riders on bikes. It is conceivable that down the line, some of those who represent the continent in the sport may have begun cycling on the Qhubeka bikes. According to charity director Anthony Fitzhenry, the Sanremo Classic is etched on his mind. He sees it as a defining moment for the sport in the country. 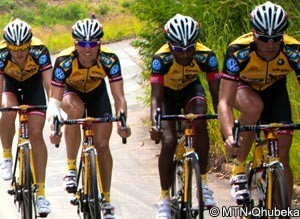 “It was a day of proving to the world that Africa has the cycling talent to compete at the highest levels of the sport. At Qhubeka our focus is on mobilising people with bicycles because we believe that bicycles can change people’s lives, whether it’s by helping them to access economic opportunity, get to school safely and more quickly, or develop a passion for the sport of cycling,” he explained. In getting involved, RCS Sport has seen firsthand the benefits of the Qhubeka project. It has also spent time around the team and its secondary sponsor, building a relationship. African fans will hope that this boosts the team’s chances of being selected for the Giro d’Italia, which would be its first-ever Grand Tour. Ciolek remains on board and there is a number of other strong riders, including many from Africa. Former Tour de France yellow jersey Linus Gerdemann has also joined for next season, and would be the likely team leader if the squad does the get the nod for the Giro.